The methodology of introspection, and especially of stimulated recall, is gaining increasing popularity in second language research. This book provides a "how-to" guide for researchers considering using this technique, contextualized within a history of the procedure and a discussion of its strengths and weaknesses. Topics covered in depth include: * research questions for which this methodology is (and is not) well-suited, * preparing for data collection, * transcribing, coding, and analyzing stimulated recall data, and * avoiding common pitfalls in the use of this methodology. By way of demonstration, the authors walk readers, step by step, through several studies in different areas of second language education which have used this technique, including L2 writing, reading, oral interaction, and interlanguage pragmatics. 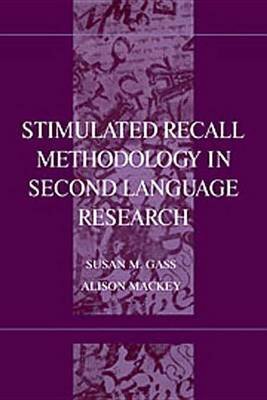 This book is one of several in LEA's Second Language Acquisition Research Series dealing with specific data collection methods or instruments. Each of these monographs addresses the kinds of research questions for which the method/instrument is best suited, its underlying assumptions, a characterization of the method/instrument and extended description of its use, and problems associated with its use. For more information about these volumes, please visit LEA's Web site at www.erlbaum.com.